She cut straight to the chase by saying she was plain and blunt and that there are no good options in Iraq. Every alternative carries with it grave risks. We have lost control. Assign missions that make sense. Quote from a soldier: Wouldn't know who to shoot at unless I was shot at. Don't have the moral or legal ground to force action. and Iran's influence in Iraq. There is danger of region-wide war. This year will be brutal. Have to attempt political settlement and increase diplomatic activity. Talk to Syria. Ahmenijhad is not the person to talk to. There are aircraft carriers in the Gulf. It would be interesting to know why. Need to have meaningful Arab Israeli talks. Peace is the right goal to attempt to achieve. You cannot build a democracy without democratic principles. Has some concerns that after this that supporting democracy will be given up. NATO training of Iraqi forces. God is on the side of Peace. Would that America becomes America again. Impressed that there is vision and the actual mention of the word Peace. At least two times. Concerned there is paralysis setting in. Must think and talk peace and diplomacy. MA: I want to hear Malaki, "Who the hell is shooting at me?" Break through... Kissinger moving toward Biden Plan. Resolution cannot come from America. CAMBRION: Is it not time for diplomacy? One third of the Senate attended hearings on Global Warming yesterday. Need a surge of diplomacy. Maintain territorial integrity of Iraq. Federalism not brought to table early on.... unfortunately. Don't pursue or precipitate break up. Biden Plan never called for this. If we increase Al Sadar will simply become mobil and increase his numberts. Plan is to keep Iraq together. Local groups who exercise some authority. All people want to be responsible for their own lives. Democracy isn't an event. It is a process. Must be careful or there will be an Arab Persian War. There is now suspicion of all motives. Use diplomach. Regional focus/ vision. colonial powers. Brit ( to U.S.) /France. Respect of Troops. eventually strength in moral U.S.A. Create minority rights and find common ground. Senator: Iraq Study Group. Traveled to Syria. met with asad. some cooperation until assassination of Harari. We gain through discussion with those with whom we disagree. both interests are the opposite of yours. She worked with Asad's father. Ask Madinijhad. (not easy) a "complex" history. Saudi Arabia (CIA) and the many personal relationships with the royal family. Didn't really get picture of Saudis working with tribal contacts to help Iraq. Saudis are worried about changes in their own country. Need constant contact, not spur of the moment trips. 1327 yrs of conflict. We can't bring them together. No comprehensive approach. What is the role of diplomacy? Force and diplomacy working together. not a chess game, more like pool. balls knocking into other balls. And N. Korea is watching. Senator: 3- 6 month list. Contact List of Regions. Executive Committee. Biden: The presidential plan is a tactic. McCain making a last chance effort. American people will walk away. per Bosnia / Kosavo ------ had Dayton discussions and accords. (these countries are no working toward reconciliation. Why won't the admin. do this? Trust isn't going to happen. No possibility of strong central government in the next ten years. She is deeply concerned about America's problems. "The mountains are our only friends" scenario. The word atrocity doesn't begin to describe the horror of the injustices committed in our name in the past and at the present time in Guantanamo and other secret prisons. I felt such joy seeing Rae stand up to and topple Fox b.s. Last evening Rae got out of jail for the arrest at Hillary's Web of Lies action and rushed off to an interview on Fox "News." Hannity was trying to get her to bash Hillary and she didn't fall for it. She stayed on topic -- why senators must get on board getting us out of Iraq -- why she would like to be able to vote for Hillary. It was today's featured video on the Fox site. This was a difficult morning for me. Besides being followed in the Capitol Hill area, which is actually sort of humorous, I had to contain myself while a man I personally despise spoke in a Senate Hearing. My brother, closest in age to me of all my brothers, was severely injured in Vietnam in 1968. The topic of war crimes in Vietnam and Cambodia are very personal matters to me. I'm not going to go into detail, but I had a hard time not beaming intense wishes for ill health at the back of his head. Biden opened the hearing with statements about "effective diplomacy" and "best strategic minds" and the three points of agreement thus far in these hearings. Troops cannot stop sectarian violence. Need for intensive regional diplomacy. He continued that we cannot build a strong central government in Iraq. Local and regional focus is needed. An article in the NYT used the term "soft partitions" for sections within Iraq. In any case he said heavy lifting would be needed and that we should always have alternate plans. Lugar then spoke about the U.S. organizing regional players, the U.S. as a source of stability, and the need to recalibrate our reference points. He also spoke of "oil assets and how the current tactic is to have a narrow focus on certain "key terrain" which holds only 7% of the Iraqi people. But coming back to reality he did say we had an unsustainable Iraqi Policy. Kissinger opened with a statement about the fundamental issue of the long term role of the U.S. and wars, events, and such we'd been involved in there at least seven times in the last 50 years. The vital nature of the region can be seen through the vital nature several presidents have given it. He then discussed the weakening role of the state in the region due to the "artiicial borders.) [Aren't all borders artificial? ] Anyway he went on to say that there are now units that have the character of states and that the upheaval extends across the whole region. He characterized the 50 year role of the U.S. as attempts for progress and peace. Aside: Lugar was exuding absolute adoration while Kissinger spoke. The conflicts between Shia, Kurd, and Sunni regions in Iran, Tukey, and Syria are all merging conflicts. He continued that the U.S. must move into a position to defend regional security. Our separating from the civil & sectarian fighting. accept Iran as a major player but not as a dominating force. U.S. must remain in region. Biden then said that this would create an explosion and nontraditional state and that we will end up with Iraq as a Federation or a dominant power. Lugar iterated the need for benhmarks, oil agreements and that we cannot withdraw from the region. Then he stated that this is predicated on a belief that the minimum can become the maximum for the region. A military veteran with pink accessories held up an Out of Iraq banner and was escorted from the room. A security officer/ capital police approached the pink person sitting next the seat where the banner carrier had been seated. She was told that if she did anything she would immediately be cuffed and this was the only warning she was going to get. Considering that she hadn't done anything.....that seemed a bit harsh. Anyway the hearing continued. Feingold asked about redeployment from Iraq, and how we can prepare. K said: Develop an international committee per the political future of Iraq. F: How do we engage neighbors? K: Discussion of proliferation of nuclear weapons by Iran. F: What will happen in Somalia and Afghanistan? K: we have to "balance" presens in Iraq. Senator Coleman mentiioned: "End" only after exhaustion, that we will be in Iraq for a LONG time, also mentioned tools for protecting Shia militia -- and asked do we have to see balance before withdrawal. K: May have to settle for a Mandala-like solution -- acceptable but not desired. We are maneuvering within extremes. Then the what can we do now questions began coming. K: I don't believe in withdrawal. Need for a regional conference about Iran. Boxer agreed that a regional conference is needed.... but..... THE PEOPLE VOTED FOR ENDING THE WAR and they got a surge. What about the Biden proposal for semiautonomous regions? Boxer: The diplomats seem to have gotten stuck. We must break free from the diplomatic stagnation. If just one diplomat would come forward. Quote per Kissingers supposed call for end and humiliation of radical Islam. Kissinger denied this "alleged quotation." Says he did not say that despite the reporters insistance that he did. Iterated need for international control. Senator B. Concern that there will be an adverse reaction to the surge if there is no positive outcome. K: We should keep in mind a move to move to concensus strategy. Don't believe we can withdraw. Need content of strategy to have direction. Can't go on as it is. Cannot include a time table. Biden: Must keep the "audience in mind" and note the difference between what is now felt and what may be felt in two or three years. Discussion that everty alternative has grave risks. Each alternative for success has more to do with what others do than with what we do. B: Can't do this by ourselves. Aren't we involved in sectarian violence. Isn't that taking sides? K: Of course.... to some extent. K: Must make attempt to break the back of militias. B. What about withdrawal from Iraq, from the region? Phased withdrawal? How to get regional partners? K: Mentioned withdrawal from Iraq could mean withdrawal from region. B: How do we get leaders to act? Questions about the Presidential job success in explaining strategy. How to speak to international community? When do we engage partners in the region. K: Now. Protect the oil industry there. Presidents since Rooseveldt have. We have permanent interests there. We can't act impulsively. Obama: The only expression has been maintain or increase troop level. What is the new Iran policy? Is that strategy articulated anywhere? K: would not object to a statement. Obama: What you say versus what administration says. Sunni Shia have been warring for 1400 years. Has been bloody and brutal. There is a limit to what the American people will accept. We base our assessment on what we cannot prove. Cannot continue at this level. Will go on for several administrations. Need to deal with militias. In the context of a grand strategy. Obama: The American people are saying, "I'm disappointed." They feel less safe. They have been asked to make an enormous investment. The outcome is worse than before. The surge isn't salient. IS there a strategy? There has been such division between the President and the Congress. No action on Baker Hamilton. Biden: Bush and Rice rejected. Isaacon: Went in to Iraq to: UN 1441. Admit our failure at yr. 3. Relate power to diplomacy. Maneuvering room for major strategy. Will it create enough resolution to create peace? Objective is compatible with what the president is to do. I am convinced we will move 2 or 3 ... toward concensus. K: Last two years of office cannot be spent in a civil ware between the executive and legislative branches. His plea. "We are there because diplomacy failed." strategy has not come forward. We should have had a Camp David with congress leaders and Bush. But no desire by Pres to do that. The surge is a tactic masquerading as strategy that will not accomplish the mission." Of course these are notes not quotes ,and are just put up for flavor of what was happening in the session. Liz was zipping between actions and meetings when she ran into John McCain in the hallway. She stepped up and firmly shook his hand and told him, "I've come from Arizona as a constituent to talk to you and tell you that you have to stop funding endless war. I know your office knows about our feelings on these issues because I fasted in front of your office in Phoenix and regularly do anti-torture demonstrations there also. McCain thanked her and hasitly departed. Huh? Did he even hear what she said? Got the wrong info. Correction. Medea Benjamin was arrested in a Senate Committee Hearing where Negroponte was testifying. Not for her distrubance of the hearing but for a bogus outstanding warrant for which she had appeared but which the court had no record. Seems they conveniently found it today. She is still in jail. Hope she is getting better treatment than the women arrested yesterday at the white rose action. One woman lost circulation in a hand cuffed to a cell wall, and the officers would do nothing. similarly another person who had recently broken an arm was similarly twisted into a painful cuffed position. I guess they want to teach us lessons or frighten us. Won't work. Medea Benjamin and six others were arrested this morning for disturbing the peace in Hillary Clinton's office. They wove a symbolic web of lies told by Hillary. The web snaked through furniture and around people throughout the office. The web Hillary spins is of course about the Iraq War and her stand on it. She now says she was always against the war, but this is a lie. She has supported this war from day one. It must end NOW! Scissors (pink and made of cardboard) were offered to her staff if she would cut the web. Two of our sisters from the pink house were arrested: Sandy and Leslie. This was Leslie's first arrest. This is what a friend says about the coming storm and action this month. Pretend you are spending the next 3 weeks in D.C..... in the power center of our nation…. Take a moment, sit or stand quietly. Breathe deeply, fold your hands, close your eyes. Let your life-style fall away from you. Put your job aside, put away the neighborhood you are able to live in and your mortgage or rent payment; put the things you are able to buy because of your job – the car, the bike, the DVD player, the cell phone, the computer, lattes, everything – put them on the shelf; put your education, the schools you are able to send your child to, the classes you are able to take, put them all on hold. Pretend you are going to spend the next three weeks of your life in Washington D.C. engaging in actions to end war. Think about what you are willing to do. Now think about the 4th week, when the bombing will likely start against Iran. Think about the 100-or so-thousand human beings whose lives are going to be vaporized. Think about the 10’s of 100,000’s of human beings whose lives will be in grave danger, the pain and the suffering of nuclear burns. Think about the millions of human beings whose lifestyles will be radically altered in Iran, the entire middle east – and around the world. Think about just one of those lives that will be destroyed – the infant just born, the mother of adolescent twins, the grown daughter of the elder who can no longer care for herself. Pretend she is someone you love fiercely and passionately. Now think about what actions you are willing to take in Washington D.C. to prevent the destruction of this one life. Pretend you are protecting your LIFE and not your LIFE STYLE. Brainstorm the actions you would take and email me! We Are Escalating Actions! You Must Also. War with Iran (which is imminent) must be stopped. It will start a chain reaction. We bomb Iran. Iran retaliates. Israel retaliates. Russia retaliates. Dr. Strangelove is ready to send out those planes (only they are ships). This isn't just a feel-good information campaign. We are calling for every person who hears this message in his or her heart or soul to begin immediate civil disobedience actions. Things we have heard people are doing --- lip-sticking every glass and mirrored surface in the country. NO IRAN WAR. People also should think about how to safely shut down business as usual in the United States through traffic stoppages. Three cars abreast on major arteries driving very very slowly during morning rush hours. Perhaps cars will begin to "stall" in critical intersections at critical times. Bush's next insane escalation will trigger true world war. We must stop him. Please act now. If not our world will have a truly Silent Spring. Multi-Banner Drop in the Hart Bldg. after talking with Gabby's staff. Marched from the Pink House to Cannon. Actually I was supposed to go with the Pinkers to Rayburn & the Shoe distribution. My shoe has Ashref Katjhem Gasem name attached. She was 5. Got to 502 Cannon after navigating the corridors, construction and ---- and ------ were already there. I wrote out a hasty note as Maura hired a new staff member – a young gentleman hired just minutes before. There was pleasant chitchat until Daniel Graver arrived and I realized he was the gentleman I’ve given the pink balls of courage to to give to Gabby at a bar in Tucson where there was a heckle the tv state of the union watching party last year. We shook hands and agreed we’d met before….and I sensed a bit of not altogether comfortable anticipation . We went with Daniel to Gabby’s office to chat. -------opened on a political campaign note. He began writing a few of the UFPJ points down that we’d put our own spin on. Troops home now. Iraqi people against us. Cut funding. Also she ran as a progressive , why hasn’t she joined the progressive caucus? What is she doing in the next two weeks to stop the illegal nuclear weapon use of the US on Iraq in three weeks? We have to observe the nuclear nonproliferation treaty. Jill & John from KBRP Bisbee came in part way into our mtg and began taping. And Maura switched with Dan to field questions. Walked with them to the Hart bldg. Met Ellen. Walked back to the Rayburn bldg. Got coffee and talked to Robin and Julia about their lobbying in the afternoon. At noon we joined a white rose action at the inner court yard fountain . I laid a card down and a few roses as the names of Iraqi dead were read. The frozen water and flowers were as stark a testimony to the dead as any I’ve seen or in which I’ve participated. Didn’t want to be arrested so I left for the Dirkson Bldg. Which is where I met up with Sam and Maureen (newbie) and walked to the Hart Bldg. The exhilaration wasn’t as strong as the first actions I did, but it still feels good –to speak our minds in the halls of our Senate offiice bldgs. And the joy of the UFPJ lobby folks who stumbled across the pink action was palpable. They thanked us, joined in the chants – as did a few staffers. We managed to get most of the banners back. My only regret is that I didn’t get a clear shot of the big banner that LA Sam and Jodie ( I think) dropped – the big 40 ft. long one that said, No More Money for War. Then it was off to the Dirkson Bldg. For a late lunch. Labels: AZ Representative Gabby Giffords, CODEPINK Banner Drop, Hart Senate Office Bldg. Don't believe the wire reports from the Washington D.C. march-- their tens of thousands should read 100s of thousands. The entire Mall was packed from Third Street to the Washigton monument. Once the march started and encircled the Capitol on all four sides before the last marchers had even started, you know that it was at least a half a million people. The Washington Post revised its count at least once already from tems of thousands to hundreds of thousands. The CODEPINK rally before the UFPJ rally had at least 3000 folks and probably lots more... but the Washington Post and all the other papers taking their lead from them presented an image of equal ranks of protestors and counter protesters. The Pink supporters numbered in the thousands, and the super conservative "counter" protesters numbered around a couple dozen. The paper gave the impression of equal amounts. Please tell your papers and local media that you are sick and tired of deceptive "reporting" and that you expect accurate and truthful reporting and the current standards are far from this standard. Arrived at the Pink House in D.C. around 8:30 p.m. So now I'm posting what I wrote earlier in the day. I’m writing as I fly toward D.C. I am unsure what sort of connection to the internet I will have for the next several days, So I will do what I am doing right now. I will compose when I can and post when I can. I’m not sure what tomorrow holds for me. (Are we ever?) I think it will primarily be internet and coffee until I plan out all the things I have as yet to find out about, then I believe there will be a meeting of women later in the day to put together the Walk in Their Shoes display that will be out on the 26th. I sent a couple pair of teenager shoes with Zanne and I have two infant sets with me. I still have to tag them with the names of infants killed in the Iraq War. These are real souls who left this world violently and unjustly. I miss my daughter already, and she is alive and well. To think of the heartache of her being gone breaks my heart. I cannot imagine what the lose of a child must be like. I hugged her goodbye this morning as she went off to school. I think she knows I am doing this for her. For her future. For all children’s futures. I am leaving my home for a month during a year that I really did not want to travel. She is 17. There are not many more months when she will live under my roof. I hate to give up spending one of those with her, but I must. This war is wrong. The visuals of masses of citizens marching should send a clear signal that there are people who feel so passionately about the need for our Representatives and Senators to stop this war, no matter what they must do in order to accomplish that, that they will come all the way across the country to march and meet with Congressional staffers. I’m reading two books right now. One is about writing biography – the biography of women. The other contains small mindfulness “talks” about peace, being peace, creating peace, breathing peace by Thich Naht Hahn. These two works are almost diametrically opposed at one level, but I am bringing them together, into peace, within my being. Learning from them both. Seeing them both. This provides excellent practice for the tasks that probably comprise my path this next month. I am not going to worry about them or even plan them out too much as I need to live in the moment and listen to my heart and notice all that is around me so that I may seize on positive action. CODEPINK was originally about bring the creative feminine into play in our world FOR Peace. I strongly believe that we must not fall into opposition or anger. We can only change things through individual action. The fierce gentle hand of mother Gaia contains us. We are her, and we must strive to live up to the wonder that is the miracle of life and breath and self organized existence. War and violence has no place in this world. Our self awareness is a rare gift – we can get beyond the aggressive territorial ape aspect of our being and consciously, mindfully become gentle and cooperative beings. We can. We will. We are. Starting at this very moment. Be Here Now. Couldn't get into my dashboard for the longest time! I'm finally back on Blogger and will be posting up a storm! Why? Because I'm headed to D.C. -- again -- for a month of civic participation as a CODEPINK Activist. Just got a $200 roundtrip fair via Priceline. Will be staying at a CODEPINK house currently being set up. I'm gonna MARCH, I'm gonna LOBBY, and I'm going to be the pink thorn that irritates the status quo on Capitol Hill for the next month. Woo Hoo! And you know what? I'm not the only Arizonan going. You could be there too. Join us! Heck-a-roonie.... even MoveOn.org sent out an email encouraging members to come to D.C. and march or join a local protest. 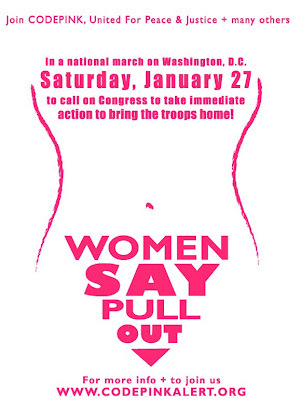 This isn't the "official" graphic for the march.... but who cares? This one is too good not to use!